As the chief executive of San Francisco self-driving truck startup Embark, Alex Rodrigues is a true believer in autonomous trucking, but that doesn’t mean he predicts a world without truckers. Rodrigues believes that autonomous driving systems will simultaneously improve truck safety and productivity while also reducing the cost of moving freight. “We’re talking about radically altering the economics of transport for 70 percent of goods in America,” Rodrigues said during last week’s Automated Vehicles Symposium in San Francisco. Those radical economics include a 50 percent cost savings per mile, Rodrigues said, enabled by improved productivity, higher safety that leads to lower insurance premiums and more efficient operations that save in maintenance and fuel costs. But during the testing and development phase leading to truly driverless long-haul trucks attentive test drivers will still be critical. Self-driving technology has yet to evolve to a point where it operates more safely than a human. That’s why Embark is currently operating a mostly automated system that relies on human test drivers to monitor the road and system performance. The system is also constrained to the highways, which are easier for the technology to navigate. “Our system is not meant to operate in cities,” said Rodrigues. A truly driverless system “is an incredibly hard problem” that could still be decades away. Last year, Embark began working with appliance provider Electrolux to transport Frigidaire refrigerators as part of a partnership with Ryder trucks. The 650-mile route starts in El Paso, Texas, and runs along Interstate 10 into Los Angeles. By the end of this year, Embark will be operating 40 trucks along the route, Rodrigues said. Embark works by exchanging trailers between local drivers and automated trucks at freight hubs situated along highways. The human driver navigates the manually driven Embarktruck into and through the destination and departure cities. But for the bulk of the trip — the highway — technology in the truck is doing the driving. The Embark trucks are equipped with sensors and self-driving software that enable automated driving. They pick up freight from the edge of the interstate and drive themselves along the route with little human intervention. A test driver is currently still in the cab, watching the road, with his hands on the steering wheel at all times. Eventually, Embark plans to remove the test driver and operate the truck with no one on board. Uber Technologies’ self-driving truck division, Otto, operates a similar system in Arizona. Lindstrom likened the Embark test system to aircraft, where the plane itself does the flying for most of a trip but pilots take over for landing and taxiing. Other companies, including major truck manufacturers, also are developing automated systems for their vehicles. Volvo Trucks, for example, is testing self-driving trucks in mines and other closed areas where they won’t have to contend with extensive traffic and passenger car drivers. 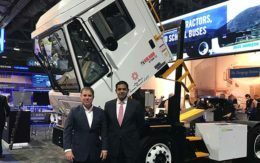 “We continue to believe that intensifying competition between startups, tech giants and incumbent [manufacturers] could pull forward the commercialization timeline for both autonomous and electric trucks,” Ravi Shanker, a trucking industry analyst at Morgan Stanley Research, wrote in a recent report to investors. The Embark system includes two redundant engine control units, as well as redundant software with two separate bases of code. Rodrigues is advocating for industry-wide adoption of Embark’s strategy for improving test driver safety. That includes hiring professional drivers who are trained and specially licensed, who have an average of 1 million miles of professional driving experience, and who have a good driving record. Drivers should go through a rigorous training program that includes extensive practice with the self-driving system on a test track. The truck itself also monitors the drivers to make sure their hands are on the wheel and that their gaze is trained on the road. And if neither are where they should be, the truck issues audio and visual warnings that if unheeded return control of the vehicle to the driver. In February, Embark ran what it called the country’s first coast-to-coast test run of an automated truck. Using a modified Peterbilt tractor, retrofitted with sensors and self-driving software, the truck traveled 2,400 miles in five days along Interstate 10 from Jacksonville, Fla., to Los Angeles. 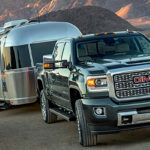 Regulations that limit drivers to 11 hours behind the wheel per day make five days the fastest a truck can legally make that transcontinental run. But with driverless trucks, Rodrigues said the same trip could be done in just two days. That’s about the equivalent of air freight, which is 10 times more expensive.